I love this month in the garden. It is full of glorious woodlanders; bulbs, herbaceous perennials, shrubs and trees that live in and on the margins of woodland; Cornus nuttali, Magnolia, Epimedium, Trillium, Erythronium, Primula, Pulmonaria and Omphaloides. 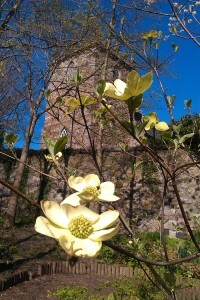 The Cornus nuttali has been super this year, with more flowers than ever. We have been watching the flowers develop slowly over the winter months with a huge sense of anticipation and we were not disappointed. It is always a delight to see the delicate flowers of Epimedium surrounded by there bronzy, heart shaped leaves. Another favourite is Erythronium californicum, ‘White Beauty’, always a delight, delicate and magical; seeming to float in semi–shade. There were other delights; Fritillaria, Camellia, Cherry blossom, Narcissus. The Volunteers worked hard all month, laying 13 tons of grey whinchip topping up the paths and steps. It was the last big ‘winter job’ and has made such a difference to the look of the garden. What a month it was though. It started off cold, windy and march – like, no surprises there. It improved and got up into the high teens towards the end of the month and everything seemed wonderful; blossom, bees, butterflies and blue skies. The garden had picnicking families one day and sunbathing beauties the next, folk were sitting on benches and snoozing in the sun, I even took off my thermal leggings! All was lovely……. and then it got cold again, diving from the high teens, right back down to -1, morning frosts, sleet and snow. Still, lets look forward to the glories of June; Lily of the Valley, Bearded Iris and Roses.